Amateur sleuth and artist Izzy Lewis’ life is getting more complicated by the moment. First, she has to deal with an ex husband she thought she'd left in the rearview mirror. Then, she happens to discover a dead body while unpacking for a local quilt show. Now, the suspect in the murder is asking for her help in proving his innocence. Talk about a troublesome trifecta! Despite the fact the accused is an ex-con, Izzy believes in his innocence and suspects the local detective is railroading the guy for personal reasons. With the help of the Qs—her Jessica Fletcher–wannabe band of seniors—Izzy sets out to uncover the truth. But with her budding relationship with her hot new neighbor on thin ice and a hyper-vigilant detective watching her every move, Izzy finds herself treading a thin line between sleuth and suspect. 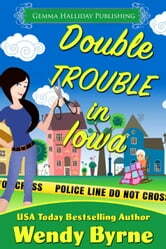 Can she catch a small-town murderer...or will Izzy be the victim of double trouble in Iowa? This town in Iowa might be one to avoid, but it's great to read about. Quirky characters keep you laughing with their antics. This is a definite to add to your tbr list. You will love it. Izzy (Isabell Lewis) is hired as a Quilt Show artistic director from the nearby town of Winterset, Iowa. While looking for more display racks, Izzy discovers the body of a young lady wrapped up in a carpet. Gus, the person last seen arguing with the deceased, and on probation for murder of his ex-wife is the prime suspect. Problem is, Izzy doesn't believe he is guilty. So she and the Q's start their own investigation. To make matters even more complicated. Joseph, her wealthy ex-husband shows up looking for the bottles of expensive wine Izzy took due to the horrible pre-nup she had been coerced to sign, claiming it was a matter of life and death, while at the same time, he was trying to have the divorce decree modified as Izzy had come into some money from her father. Wendy Byrne wrote a fun story that has well developed characters, along with lots of action and plenty of hi-jinx from the the octogenerian Q's.